Additionally, a new buffered bike lane proposed by Councilman Bobby Henon passed City Council unanimously. This will be the first buffered bike lane to be installed that would remove a lane of vehicular traffic since 2012, when Council passed a bill requiring they vote on such things instead of trusting engineers’ and other experts’ research and reports. Henon’s new bike lane will be along Tyson Avenue in Northeast Philadelphia, from Roosevelt Boulevard to Frankford Avenue. The Bicycle Coalition’s Bob Previdi testified in favor of the bike lane on June 7. The spot of the proposed Tyson bike lane. 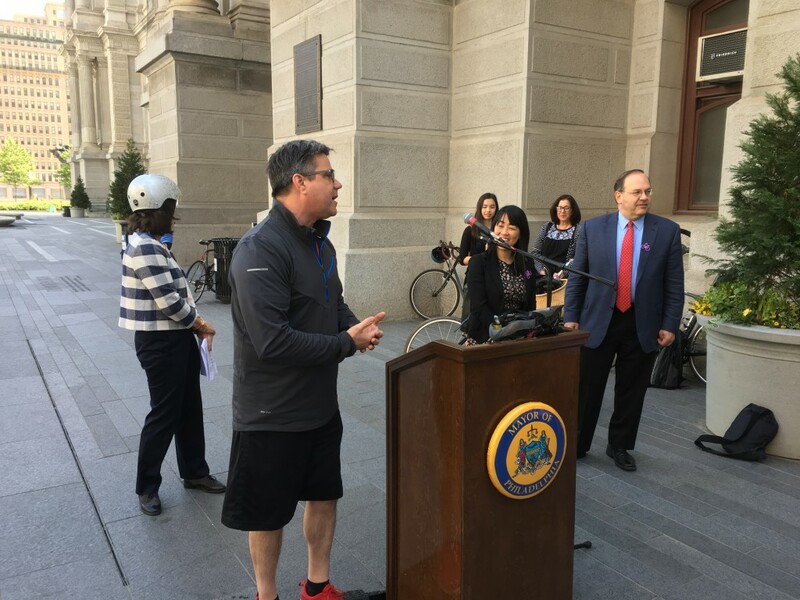 Henon has also successfully advocated for a parking-protected bike lane on Ryan Avenue in his Northeast Philadelphia district, which is set to be installed this summer. Prior to 2012, the Streets Department were able to put in buffered lanes, but City Council adopted an ordinance requiring that any proposed bike lane that removes parking or travel lane has approval by Council. Unfortunately, this provision makes streets less safe for cyclists, pedestrians, and motor vehicle drivers. Henon’s bike lane projects are steps forward for Philly’s cyclists and pedestrians.